It was alot of fun making them. Vaiden loved to help, but his number one interest was eating all of the goodies that went on the cupcakes. I guess I can't blame him!! Happy Thanksgiving Everyone!!!! 4th and 4th Game~I've been tagged!! I knew Kelly would get me in on this when I saw that Brittany had gotten her...Well, here are the rules of the game: 1.Open your pictures folder (or Picasa) 2.Go to the 4th folder 3.Open the folder and pick out the 4th picture 4.Once you find that picture, share the picture and what it means to you or what is going on in the picture. This is my 4th and 4th...I love to scrapbook the lives of my 2 beautiful boys. This page is in Vaiden's 2nd year book. He was playing around one morning~just acting like a kid!! He had one of Michael's hunting map holders and a cowboy hat that he had gotten from a birthday party and he was just having fun. I started taking pictures that day because I thought he looked so cute. I never dreamed that I would get such great shots~gotta love the one of his hat falling!! In the picture (top right) is of him taking a quick break to watch Mickey Mouse. I love how he is just standing there~still in character!! 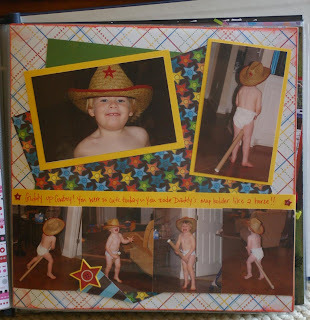 This scrapbook page reminds me of how much I love to scrapbook my children's lives. It also makes me remember how young and innocent our children are. Vaiden has grown up so much this past year and I truly look forward to the days and years ahead!! I love this little man!! I will tag: Angela, Fran, and Natalie!! We bundled up on Saturday and headed to the Grove. It was a very cold day, but it was a lot of fun too. While Michael, Vaiden, and I watched the band play in the Grove, Colonel Rebel was hanging out. With a lot of begging, Vaiden agreed to have his picture taken with Colonel Rebel and his Daddy. Vaiden said that listening to the band was his favorite part of the Grove. It was really cute listening to him sing his version of Hotty Toddy!! He was waving his hands and clapping like everyone else!! He is such the cheerleader!! Michael and I went to the game and we sat in the Rebel Club. It was so nice because we were able to go inside during halftime and get warmed up. Also, the hot chocolate they served helped keep us warm too. The Rebels won and they became bowl eligible on Saturday. We are all so excited. Go Rebs!! Chip laughed at Whitten and asked if he was praising God with that little hand up!! Whitten was dedicated on Thursday night at Pinelake. It was such a special night for Michael and I. We had several family members come to see his dedication and it meant the world to us both. Whitten is one special little boy and we pray that he will one day come to know and love the Lord. I was in my parents bathroom cleaning Vaiden's nose and Whitten, of course, followed us in there. As I was cleaning Vaiden's nose, I heard Whitten laughing. I turned around and he had pulled up to my mom's drawer and pulled everything out. It was so funny to see him have such a fun time throwing those clothes out of that drawer. He didn't stop until he had every piece on the floor, then he got down and then crawled away. Whitten has recently being very interested in books. As you can see from a previous post, we are reading to him every night before he goes to sleep. The other morning, we were all in Vaiden's room and I was hanging clothes. The boys were playing and Whitten loves to crawl around and be nosey!! Things got quiet and then I heard Vaiden reading a book. I look over and notice that he has pulled Whitten between his legs and was reading a book to him. The funny thing is that Vaiden was actually "reading" (he has memorized many books). It was the sweetest sight a mother could see. I am so happy these two boys have each other!! I am also extremely happy to have had my camera handy to capture this moment!! We once again loaded up the kids, tents, chairs, and good food and headed to the Grove. Ole Miss played and actually beat Auburn this past weekend!! We had a great time with family friends and the weather was perfect!! This is the scene in my house every night around bedtime. I just can't get tired of seeing my 3 boys together!! Whitten loves to listen to Michael's voice. He looks at Michael's face more than the book. It is so sweet to watch!! My boys love their Daddy and their Daddy sure loves them!!! Whitten has finally got his teeth to come through those sore gums!! It seems like he has been working on these teeth for 3 months. Isn't he the most adorable little thing?? We had a blast this Halloween!! The weather was perfect and the town was ready!! We trick or treated on Lamar and it was packed full of fun houses, scary people, and other cute kids dressed for Halloween. As we were trick or treating on Lamar, the local Fire Station had a haunted house and they gave out candy and balloons. The firefighters were especially excited to see Vaiden (the firefighter) and Whitten (the Dalmation) coming!! And I, of course, was excited to get a picture of us all in front of the fire truck!! After walking up and down Lamar, we went over to the carnival at First Baptist. It was alot of fun also. Vaiden got to jump on the big jumpies and play alot of silly games for candy. He had a blast and of course, Whitten loved just watching Vaiden and all of the other people around. He had a great first Halloween!! My mom came up last week for a couple of days while Michael was out of town. She was such a help and it was fun having her here!! Her treat for coming was to go to Vaiden's school Halloween Party. He was so proud to have her there. He showed her around and introduced her to all of his friends at school. We love you, Sittie! !